OTTAWA — On a night when the league’s biggest stars were celebrated at the Shaw CFL Awards, Mike Reilly emerged with the league’s top honours for the first time in his career as he was named 2017’s Most Outstanding Player. The Calgary Stampeders, Winnipeg Blue Bombers and Toronto Argonauts split the other awards in a star-studded evening recognizing the incredible accomplishments of players and leaders across the league. The Shaw CFL Awards, hosted by TSN’s James Duthie, took place at the Shaw Centre as part of the festivities for the 105th Grey Cup presented by Shaw. » CFL Simulation: An unexpected Grey Cup favourite? James Wilder Jr. took home top rookie honours, while Stampeders sophomore linebacker Alex Singleton was named the CFL’s Most Outstanding Defensive Player. Winnipeg Blue Bombers running back Andrew Harris earned accolades as the top Canadian in his second season playing for his hometown team. Argos head coach Marc Trestman was named the CFL’s Coach of the Year after leading the Argos from 5-13 to 9-9 and a trip to the Grey Cup Championship. The Commissioner’s Award, recognizing an individual or group for outstanding contributions to the league, was awarded by Commissioner Randy Ambrosie honouring the memory of Rick Sowieta. 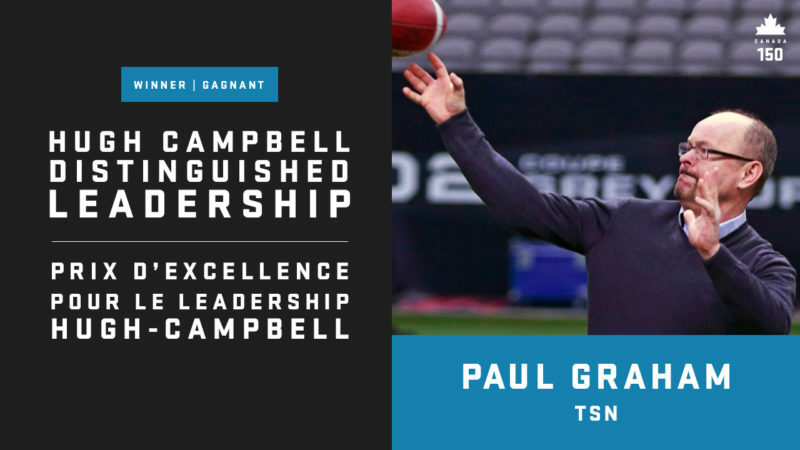 The Hugh Campbell Distinguished Leadership Award, chosen by the Commissioner of the CFL to recognize an individual who has demonstrated great leadership and has made significant contributions to the league, was awarded to Vice President and Executive Producer at TSN Paul Graham. The CFLPA announced Adarius Bowman as its 2017 recipient of the Tom Pate Memorial Award, given to a player who has made a significant contribution to his team, his community and Association to celebrate outstanding sportsmanship. Veterans Affairs Canada and the CFL also recognized Luc Brodeur-Jourdain as this year’s recipient of the Jake Gaudaur Veterans’ Award. The winners of the Shaw CFL Awards were selected by a panel of voters which included representation from the Football Reporters of Canada from all nine CFL markets, the national chapter of FRC voters and the head coaches of the CFL. In total, 77 voters completed their ballots. Most Outstanding Rookie James Wilder Jr.
Mike Reilly capped off his best season so far in the Canadian Football League by taking home Most Outstanding Player honours. The 32-year-old hit career highs in passing yards (5,830), passing touchdowns (30) and rushing touchdowns (12) on the way to leading the Edmonton Eskimos to the Western Final. Reilly became the first Edmonton Eskimo to win the league’s top honour since 1989, when Tracy Ham took home the accolade. He also became the seventh Eskimo player to win the award, making it nine times that the award has gone to Edmonton. Reilly improved his career record in the CFL to 45-33 and it was the third consecutive season he has been named Edmonton’s Most Outstanding Player. The Kennewick, Wash. native led Edmonton to a 12-6 record in the ultra-competitive West Division, becoming the first 12-win team to finish third in the division. The Eskimos led the league in passing yards. Reilly received 64 first-place votes and Toronto Argonauts quarterback Ricky Ray was runner up. After the impressive 2017 season that Winnipeg Blue Bombers running back Andrew Harris had he was named the Most Outstanding Canadian. Harris carried the ball 189 times, leading the league in rushing yards with 1,035 and yards from scrimmage with 1,892. This season Harris threatened to become the first player in CFL history to record 1,000 rushing and receiving yards. Despite falling short of the milestone, Harris set a new running back record of 105 receptions, breaking Craig Ellis’ record (102) set in 1985. The tailback became the first player in CFL history to rush for 1,000 yards and 850+ receiving yards in a single season. Harris played a big role in Winnipeg hosting its first playoff game at Investors Group Field, the Bombers’ first home playoff date since 2011. In his eight years in the league, Harris has amassed 6,268 rushing yards, 4,127 receiving yards and 60 total touchdowns. After he thanked the Wally Buono and the BC Lions organization for giving him a chance during his acceptance speech on the stage in the Shaw Centre in downtown Ottawa, Harris told members of the media that it was the people who doubted him that made winning that much sweeter. The last Blue Bomber to take home the Most Outstanding Canadian Award was Doug Brown in 2001. The running back received 74 first-place votes and Ottawa REDBLACKS Brad Sinopoli was runner up. Marc Trestman did what every coach hopes to do when they come into a struggling team – turn them into a winning team that goes to a championship. 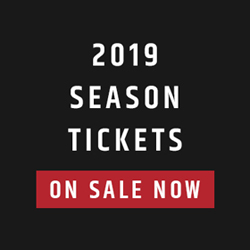 Trestman – who returned to the CFL after being away for four years – did just that with the Toronto Argonauts this season, turning the team from a 5-13 record to a trip to the 105th Grey Cup presented by Shaw. After being named the head coach in late in February, Trestman flipped the team from bottom dwellers in the East Division to East Division Champions in one year. He was instrumental in the team hosting their first playoff game since 2013. 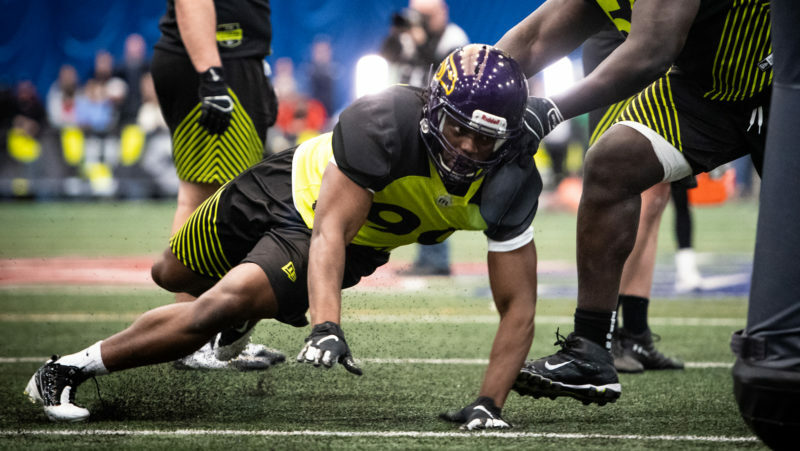 He made roster movies in the off-season helping to improve the defence by adding Marcus Ball, Victor Butler and All-Star linebacker Bear Woods, to name a few. He also added key pieces to the offence while making sure that Ricky Ray was indeed his starter for the 2017 season. Trestman becomes the first Argonaut to win the Annis Stukus Award since 2012 when Scott Milanovich won the award. This is Trestman’s second honour: he won his first Coach of the Year award in 2009 with the Montreal Alouettes. Trestman recorded 54 first-place votes and Calgary Stampeders Dave Dickenson was runner up. 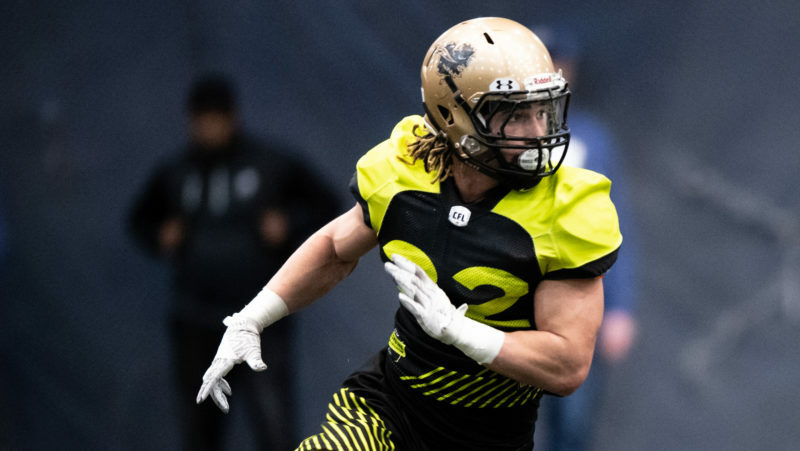 Alex Singleton exploded onto the scene in his second CFL season and was named the Most Outstanding Defensive Player. Singleton set a new Canadian record for most tackles in a season with 123, good for second in the league and a new franchise benchmark. Singleton anchored a defence that allowed a league-low 349 points (19.4 points per game), created a CFL-best 50 sacks and forced the most turnovers. Singleton added four sacks, a forced fumble and one interception of his own and finished second in the CFL with 151 total defensive plays. The last Stampeder to take home the top defensive honour was John Grace in 2005. Singleton tallied 74 first-place votes and Montreal Alouettes linebacker Kyries Hebert was runner up. Roy Finch was all over the field in 2017, making defenders miss on special teams and putting his name in the record book. That performance helped him to be named this year’s Most Outstanding Special Teams Player. The Stamps return man had one of the best seasons in CFL history when it came to punt returns. His 1,200 punt return yards were the third-most ever in a season, trailing only Henry Williams in 1991 (1,440) and Chris Wright in 1995 (1,236). Finch averaged 16.4 yards per punt return, a benchmark that puts him third in the record book behind Leon Bright and Larry Highbaugh who both averaged a CFL-best 16.8 yards per punt return. The third-year player scored three punt return touchdowns and recorded nine punt returns that exceeded 30+ yards. The Oklahoma Sooner product added 696 kickoff return yards and 18 missed field goal return yards for 1,914 combined return yards on the season. He is the first Stampeder to be named the Most Outstanding Special Teams Player since Rene Paredes in 2013. The speedy returner also pitched in on offence tallying 114 rushing yards on 21 carries and 133 yards through the air on 18 catches. In his career, he has scored four punt return touchdowns while averaging 14.9 yards per punt return. Finch received 61 first-place votes and Ottawa REDBLACKS Diontae Spencer was runner up. 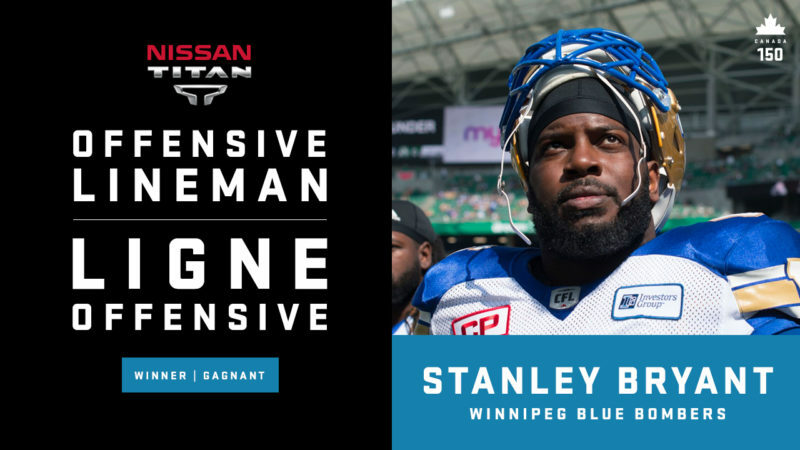 In his third season with the Winnipeg Blue Bombers, Stanley Bryant anchored an offensive line that rushed for the most yards and scored the second-most offensive points in the CFL. The Goldsboro, N.C. native became the first Blue Bomber to take home the top offensive lineman honour since Dave Mudge did so in 2001. Bryant started in 18 regular season games this year and played an integral role in Matt Nichols setting new career highs in passing yards and touchdowns. The East Carolina standout received 60 first-place votes and Toronto Argonauts Sean McEwen was runner up. Most Outstanding Rookie: James Wilder Jr.
James Wilder Jr. wasn’t alone on stage after winning Most Outstanding Rookie at the Shaw Centre in Ottawa. He invited his entire group of offensive linemen to join him to accept his award. That group of men in the trenches helped open up holes for Wilder to rush for 872 rushing yards and average 7.1 yards per carry. Wilder also caught 51 passes for 533 receiving yards and scored a total of five touchdowns on the year. He finished fifth overall in rushing yards despite starting in just ten games. The running back started the year on special teams but didn’t take long to spark the Argos’ once-struggling backfield, with Head Coach Marc Trestman putting his faith in the 25-year-old. In the first 10 weeks of the season, Wilder accumulated 261 yards from scrimmage (169 rush, 92 receiving). Once the second half of the season began, Wilder exploded onto the scene. The Florida State product recorded 1,141 yards from scrimmage (700 rush, 441 receiving) in his last seven games en route to securing the regular season’s East Division title for the Argonauts. Wilder had a chance to make the starting lineup early the season with Brandon Whitaker dealing with injuries but wasn’t able to hang on to the spot. The last time an Argonaut won Most Outstanding Rookie was Derrell “Mookie” Mitchell in 1997. The running back received 72 first-place votes and Calgary Stampeders Marken Michel was runner up. Canadians take pride in the nation’s rich history and military heritage, and a large measure of that is owed to the selfless service and contributions of Canada’s Veterans, still-serving members and those who have made the ultimate sacrifice. Veterans Affairs Canada is committed to honouring and remembering each of them. Sherry Romanado, Parliamentary Secretary to Minister of Veterans Affairs and Associate Minister of National Defence, the Canadian Football League (CFL) Commissioner, Randy Ambrosie, and Jackie Gaudaur, daughter of the late Jack Gaudaur, presented the Jake Gaudaur Veterans’ Award to Luc Brodeur-Jourdain, centre for the Montreal Alouettes. Brodeur-Jourdain, this year’s recipient, has made 97 consecutive starts at the centre position, one that not only requires strength and endurance because of the physical contact on every play, but a great knowledge of the game as well. In order to be on top of his game, he is always one of the first players to show up at the team’s facility, well before sunrise. Off the field, he has been a pillar of the Together at School with the Alouettes Program, during which Alouettes players visit thousands of Quebec students in hundreds of schools in the off-season in order to help them make better decisions and to stay in school. 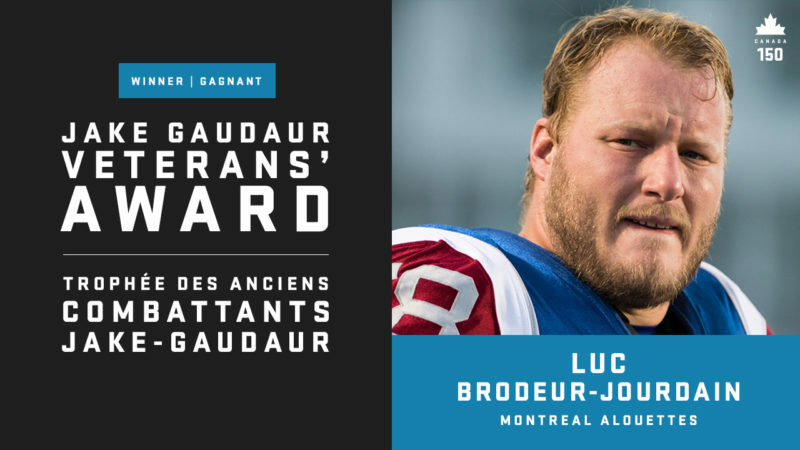 Veterans Affairs Canada and the Canadian Football League are proud to recognize Luc Brodeur-Jourdain as this year’s recipient of the Jake Gaudaur Veterans’ Award. At each Grey Cup, the Canadian Football League Players’ Association has the honour of presenting the Tom Pate Award. It is an award presented not just for one’s ability to perform on the field, but rather it is an award given to a player who also displays qualities that distinguish them from their peers off the field as well. Tom Pate had a unique combination of outstanding sportsmanship, dedication and sense of community. He was educated at the University of Nebraska where he majored in business administration while playing for the Cornhuskers. He joined the Hamilton Tiger-Cats in 1975 and as a rookie played 14 regular season games. In October 1975, his life was abruptly ended, when in his fourteenth game against the Stampeders in Calgary, he suffered an aneurysm in the fourth quarter. Pate, only 23 at the time, never regained consciousness and passed away just two days later. 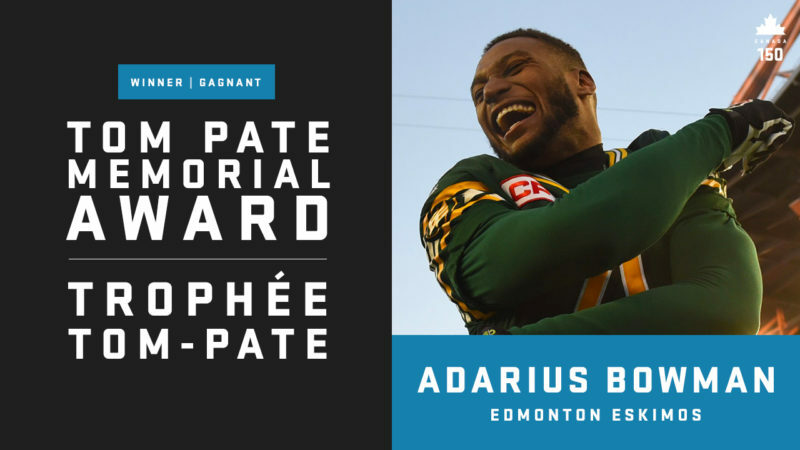 The CFLPA is proud to announce Adarius Bowman of the Edmonton Eskimos as the 2017 Tom Pate Award recipient. In 2017, Adarius has worked as hard off the field as he has on it, devoting his time within the Edmonton community. In 2017 he started Adarius for Autism (A4A) which assists youth diagnosed with Autism Spectrum Disorder (ASD) by offering needs-based training to ease the transition to becoming a contributing member of society. Giving back to the community is nothing new for Adarius as he has spent countless hours devoting his time to worthwhile causes. Each year, the current CFLPA membership across the league select a teammate to be nominated for this award and represent their respective team. The recipient embodies the qualities that distinguished Tom Pate; qualities that recognize a player with outstanding sportsmanship, a player who has made a contribution to his team as well as to his community and to his Association. From the nine Team nominees, one individual member is selected to receive the honour of being awarded the winner of the Tom Pate Award for that season. Leading Canadian broadcaster Paul Graham, who has devoted much of his decorated career to bringing the Canadian Football League home to Canadians, has been honoured with the Hugh Campbell Distinguished Leadership Award. A life marked by a devotion to football and a willingness to help others was honoured this evening with the posthumous presentation of the Commissioner’s Award to Rick Sowieta. “A wise man once said that the meaning of life is to find your gift, and the purpose of life is to give it away. 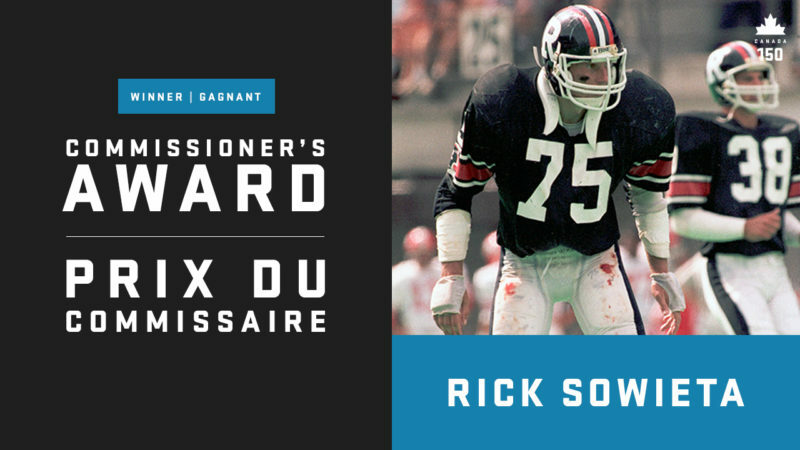 As a young man Rick Sowieta found he had a gift for football, and he spent the rest of his life giving back to the game at every level,” said Randy Ambrosie, Commissioner of the Canadian Football League. 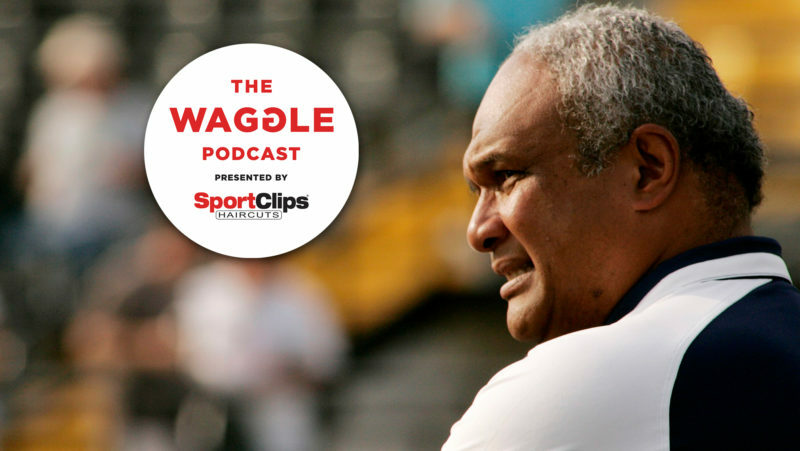 Sowieta had an impact on football across the country, working with national and world teams, and serving as the Director of Sport with Football Canada. But it was in Ottawa, the town he grew up in after his family immigrated to Canada, where Sowieta left his greatest marks on the amateur and professional games, from community sandlots to the stadiums of the CFL. Sowieta played high school football at Glebe Collegiate, junior football for the Ottawa Sooners, and after playing U.S. college football at the University of Richmond, broke into the CFL with the Toronto Argonauts in 1977 and 1978, before playing for the Ottawa Rough Riders from 1979 to 1986, where he was an Eastern Division All-Star. Following his playing days, Sowieta coached community football with the Canterbury Mustangs, high school at St. Mark and St. Patrick’s, university at the University of Ottawa, junior with the Sooners, and semi-pro with the Bootleggers. He also worked with national teams on the men’s and women’s sides as well as being an active member of the CFL and Rough Rider Alumni Associations and serving on the Selection Committee of the Canadian Football Hall of Fame. “Football was always Rick’s first passion and coaching was a huge part of his life. Football shaped him into the strong man he was, it forged the strong will he had, and it created the incredible bond he shared with this teammates,” said Jenny Sowieta, Rick’s wife. The Commissioner’s Award recognizes dedication to Canadian football. Past winners include Bernie Custis, Russ Jackson, Wally Buono and Ron Lancaster. It was presented tonight as part of the Shaw CFL Awards, a highlight of the week leading up to Sunday’s 105th Grey Cup presented by Shaw.